For this second edition of BM#7, I had planned to combine two themes together by cooking from cookbooks, all crunchy snacks for kids. Guess I plan something, something else always happens. The oft beat statement is what I have to offer, life has become hectic. How hectic is something we refuse to even think. Result is that made me realize that life is swiftly passing away and we spend most times just trying to manage to do things on time, not really savoring that moment or doing anything that we want to do. Getting up early in order to blog, but getting caught up with something. Post is left undone, it’s time for starting the cooking for the kids lunch box, breakfast. Time simply passes off so quickly that I don’t even get a moment to look at the clock. I simply know it’s gone. I guess if not for Blogging Marathon, I might never feel a pressure to post something. I am not complaining, mind you. After all this is the only thing I am doing these days for myself. There were lot of things I used to do sometime back, which I no longer do now. When I see others doing it, I really wonder why I am not doing it. Like I heard couple of my friends discussing books, and I hardly know the best seller now. Not just best sellers but anything at all. My friend of 25 years called up this morning. After cursing the world for the past 15 years, he is finally coming back to settle down with his parents. I felt so happy hearing his voice. It’s really such a warm feeling hearing to the voice that reminds you of your childhood. The last time I spoke to him, I sensed a drift in his voice, now it was more clear and strong which said he did the right thing coming back to home. I was really happy for him. I know I started this somewhere and took a turn completely off the track. But then this recipe was something that’s been on my do to list for a long time. A recent resolution that I made to myself, was to simply attempt whatever comes to mind and not bookmark anymore. I hardly bookmark recipes. The ideas simply stock in the mind to take a different shape all together. 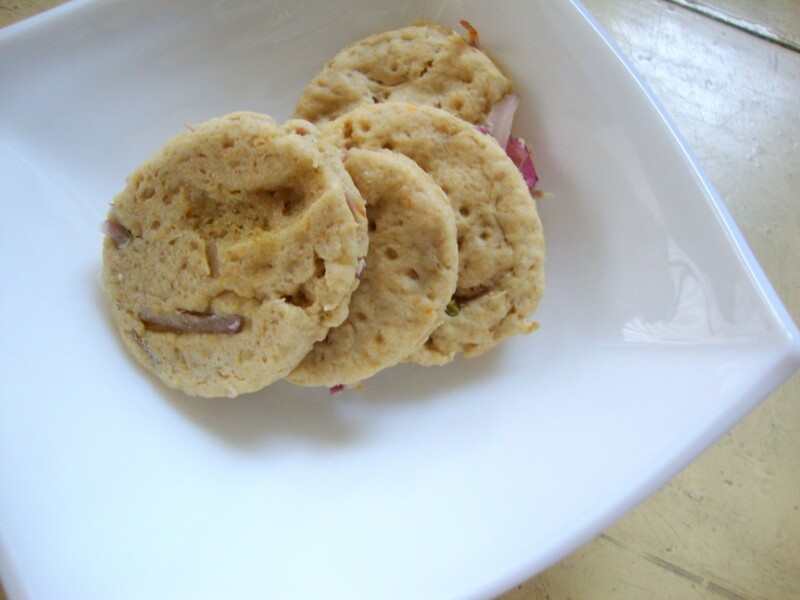 For example this onion crackers or savory cookies with onions and chilies, is something I had read on many blogs but I never really remembered the recipe proportion. When I was hard pressed for time and the need to make this yesterday, I simply used the same proportions and changed few things and arrived at this. 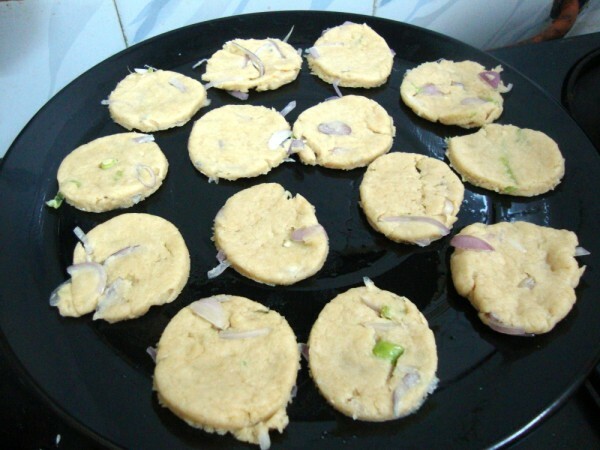 A delightful mix of spice and flour, you have this cracker ready for your evening snacks. 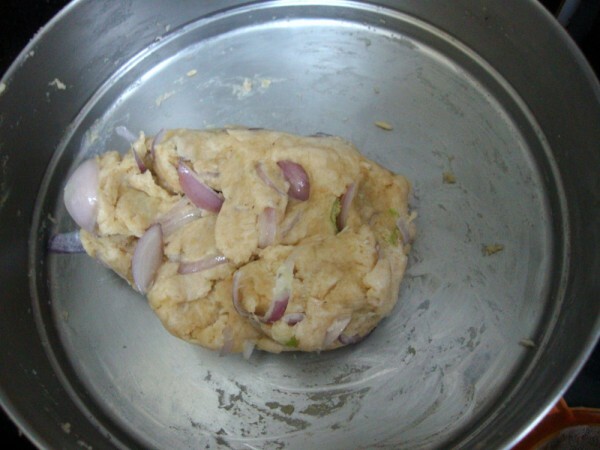 Melt the shortening/ Vanaspathi in microwave for 30 secs. 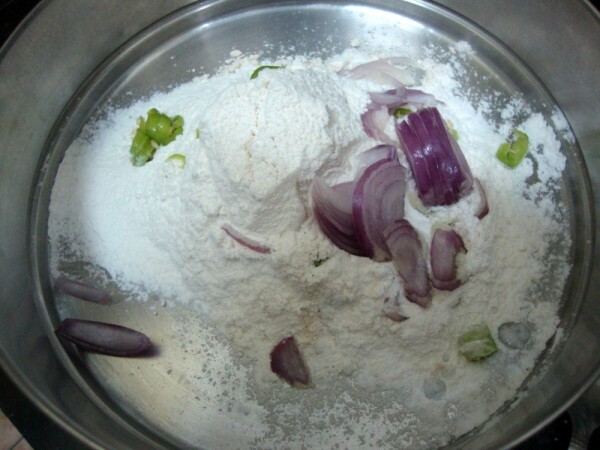 In a bowl, shift the flours along with baking powder and salt. Then add the onion julienne, finely chopped green chilies. Mix well. Slow add the melted vanaspati and olive oil. Knead to a sift dough. At this stage it depends on how well it leads to be rolled out. So add milk slowly and knead well. Read notes. Cut out into discs using cookie cutters. Arrange on a greased baking tray. Pre heat oven at 170 C and bake for 15 mins at 170. 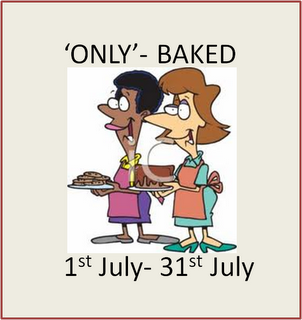 Check and again bake. I baked it for total 30 mins. Notes: After 15 mins, I thought it was enough. Though it was baked and done, after a while it became soft. so I baked for another 15 mins. It was perfect and even after storing in a box, it remained crunchy. 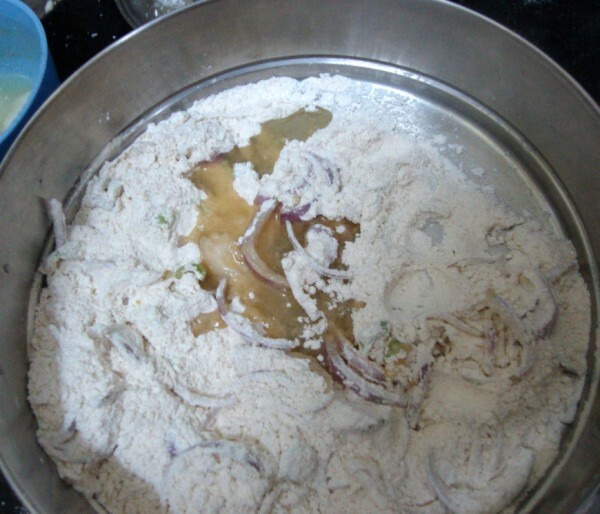 My dough was almost like a chapati dough but not so soft. If you want, you can pop it in fridge and reduce the milk in that process. This might reduce the baking time. Please check after 15 mins, if the crackers are brittle to touch, they will hard up after cooling. If they are soft you need to bake for some more time. This recipe is more of an experiment in your oven. Maybe I can give an exact timing when I make this again. 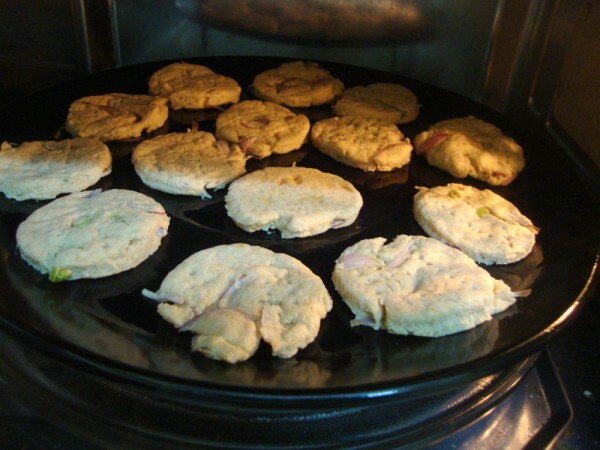 Onion must have added a nice flavor to these cookies.Must try these…. 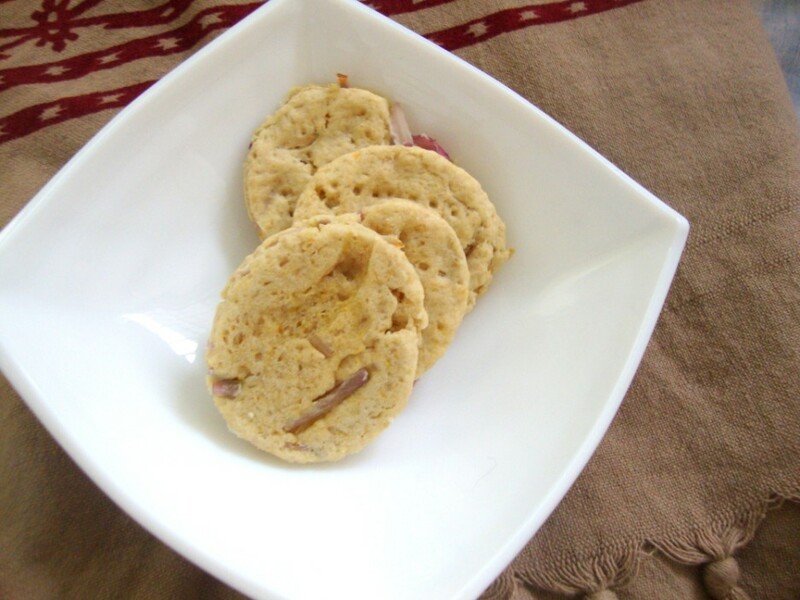 These savory crackers are welcome change from the usual sweet cookies. 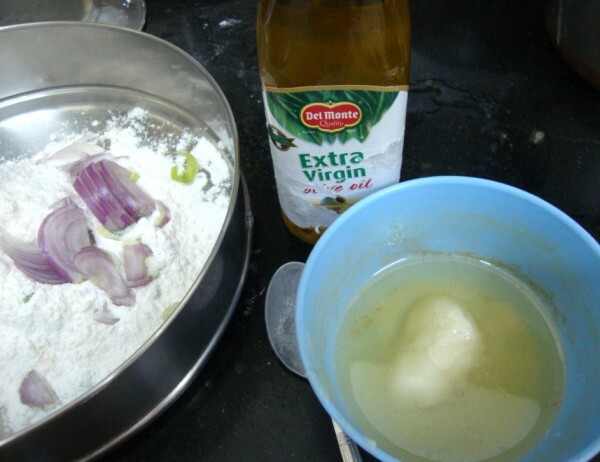 Must try out soon as it is quite simple!!!! Sounds very interesting and yummy! Love savory snacks!! Looks so good..
My husband is after me to try some savory bakes instead of the regular sweet cakes/muffins/cookies etc. I think this would be a welcome change!! Looks so nice.All ur cookies this time looks delicious and simple. Good deviation from the regular sweet stuff! This looks like a good recipe I could cook for my kids. Agree with you that time is just whooshing past us and we don't have time to even take a breath and enjoy the moment. Onion crackers have come out very well. They look delicious.